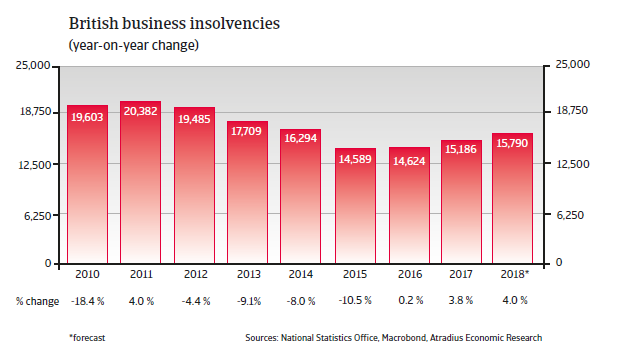 After an increase of 3.8% in 2017, British business insolvencies are expected to rise again in 2018. The expected increase is the result of the lingering uncertainty surrounding Brexit impacting business investment, reduced consumer spending power and higher input costs due to depreciation of the pound sterling. Businesses active in the construction, retail and hospitality sectors are the ones mostly affected by increasing insolvencies. 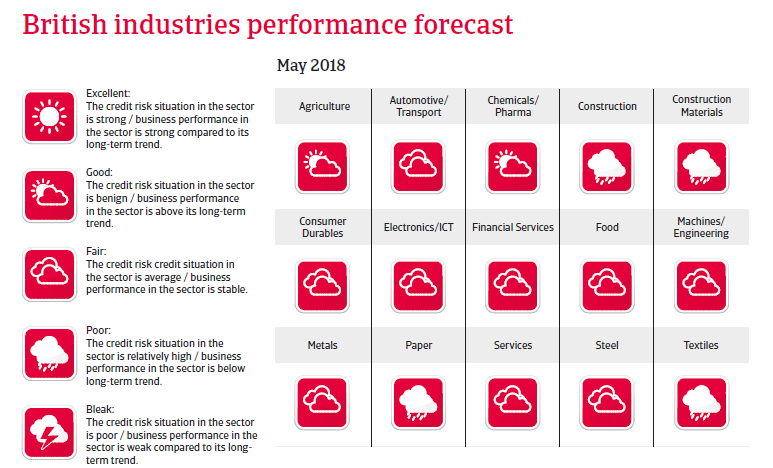 In the aftermath of the June 2016 Brexit vote the UK economy has remained resilient, and GDP growth is not expected to record a major slowdown in 2018. However, the ongoing uncertainty surrounding Brexit could impact this rather positive outlook. UK exports have benefitted from increased international competitiveness due to the weaker pound and higher global demand. Industrial production increased 2.1% in 2017 – the highest rate in seven years. Export growth is expected to remain robust in 2018. 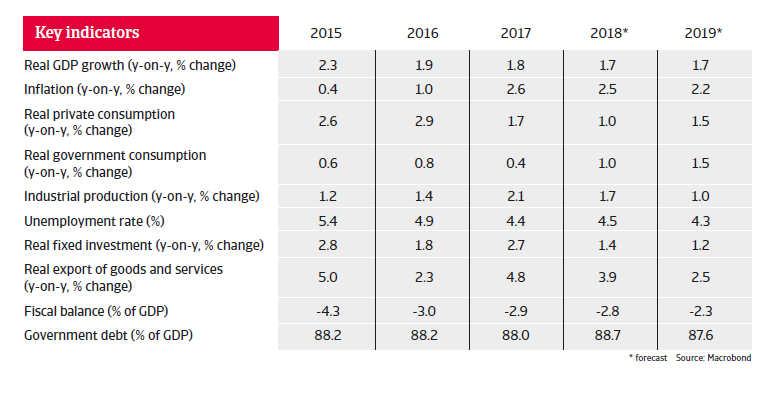 While consumer spending has been the engine of economic expansion in the past, higher inflation due to the weaker pound and decreased real wages negatively affected household consumption in 2017. Higher interest rates and fiscal tightening will impact private consumption growth in 2018 and 2019.
Business investment growth slowed down in 2017 due to increased uncertainty over the course of the EU-UK negotiations and higher interest rates. It is expected to remain below average in 2018 and 2019. The March 2018 EU-UK agreement on a transition period following Brexit in March 2019 to December 2020 has offered at least some relief to British businesses, with brighter prospects for a “smooth” Brexit. But insecurity over the long-term future of the EU-UK trading relationship remains. Besides the potential repercussions of Brexit, another potential downside risk is the increase in consumer debt, coupled with stagnant household incomes. Household debt has increased to 140% of household disposable income, and this poses a potential risk to the financial sector.